Mukesh Ambani led Reliance Industries is India’s most powerful public company, as per the recent Forbes ‘Global 2000 List’, which ranks world’s most powerful and influential public companies. With market value of 50.9 billion dollars and 72.8 billion dollars in sales as on May 2014, Reliance Industries is ranked at #135 in this list. SBI, with $23.6 billion market capital is ranked next at #155. Also included in this list are: Bharat Petroleum (1045), HCL Technologies (1153), Hindustan Petroleum (1211), Adani Enterprises (1233), Kotak Mahindra Bank (1255), Sun Pharma Industries (1294), Steel Authority of India (1329), Bajaj Auto (1499), Hero Motocorp (1912), Jindal Steel & Power (1955), Grasim Industries (1981) and JSW Steel (1990). When this unique survey started in 2003, companies from 46 countries contributed to this power list of 2000, whereas this year, this count has increased to 62 countries. Overall, these 2000 most powerful public companies raked in revenues worth $38 trillion, thereby generating profits of $3 trillion. Combined, they possess assets worth $161 trillion, and market value of $44 trillion. Total of 90 million people are hired by these 2000 public companies. Compared to last year, the statistics have increased 13% on an average on every count. The four main aspects which are calculated while creating this list are: revenues, profits, assets and market value. China, holds world’s three most powerful public companies, and has captured 5 out of top 10 spots. 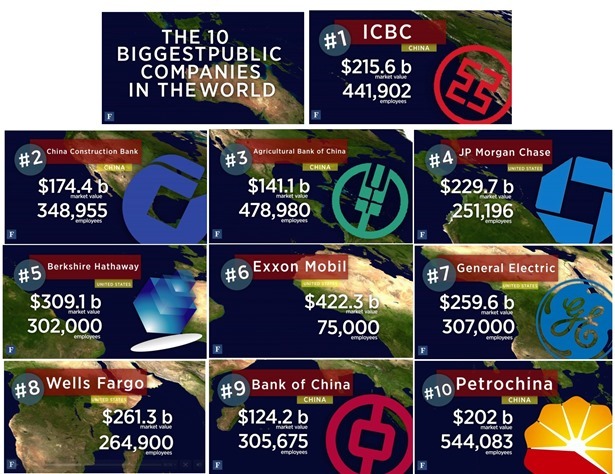 American companies filled up the rest of the top 10 companies. Government controlled Chinese bank ICBC has retained it’s #1 spot from last year, whereas China Construction Bank took second place and Agricultural Bank of China is at #3. Bank of China is at #8. American companies Berkshire Hathaway and Wells Fargo have both improved their position and have taken position #5 and #9. JP Morgan lost its position and is ranked at #4 this year. USA has the maximum number of companies in this list at 564, followed by Japan with 225 companies. China added the most number of companies to this list year with 25 new entrants. Mauritius, Slovakia, and Togo debuted this year. You can see the complete ranking here.